Clean the chicken properly; pat dry inside and out. Sprinkle 1 1/2 tsp. of the barbecue rub inside the big cavity of the chicken. Sprinkle another 1/2 tsp. in the smaller neck cavity. Rub oil all over the outside of the chicken. Sprinkle the outside evenly with 1 1/2 tbsp. of the barbecue rub. Open the beer; remove approximately 1/2 cup. Poke more holes in the top of the can with a church key type can opener to allow the proper amount of steam to be released while grilling. Add 2 tsp. of the rub to the beer can. Be prepared for some foaming when the rub is added. Carefully slide the chicken over the can so that it slides into the cavity without tipping the can. Holding onto the chicken with one hand, use the other hand to pull the legs forward to support the chicken in the front and allow the can to support it in the back. Wrap the ends of the legs with foil. Tuck the chicken's wings back behind it to hold them in place. The chicken should be able to support itself and stand on its own. Set up the grill for indirect heat and allow it to heat to a medium temperature. Carefully pick up the chicken while holding on to the can and set the chicken and beer can upright on the grill in the area away from the direct heat. 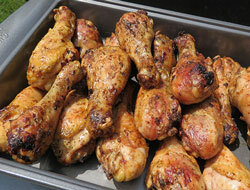 Cover the grill and allow the chicken to cook for 1 to 1 1/2 hours or until it is properly cooked. A thermometer should registers at 170° F.
When the chicken is done, hold on firmly to the top using a potholder, layers of paper towel, or large tongs to protect against burning; protect your other hand with an oven mitt or use another set of tongs to get a firm hold on the beer can; then lift the chicken off the grill. 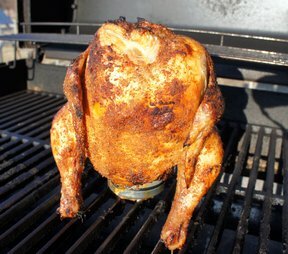 Allowing the chicken to stand for 15 to 20 minutes and then remove it from the beer can. 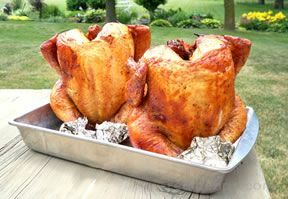 Hold on firmly to the top using a potholder or layers of paper towels to protect against burning; use a potholder or mitt on your other hand and get a firm hold on the beer can; twist and pull the can out of cavity of the chicken. 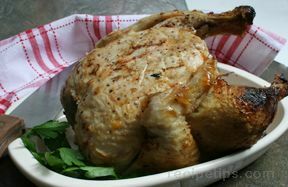 "This recipe was easy and turned out great. My wife was impressed!"